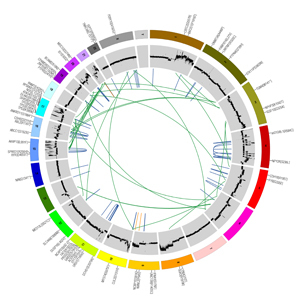 A circos plot shows tumor DNA from a breast cancer patient who didn’t repond to estrogen-lowering drugs, often prescribed to shrink large tumors before surgery. Women who didn’t respond had tumors that were genomically more unstable, with higher rates of mutations and other changes. Researchers at Washington University School of Medicine in St. Louis uncovered mutations linked to whether or not women respond to aromatase inhibitors, drugs often prescribed to shrink large tumors before surgery. These mutations also correlate with clinical features of breast tumors, including how likely they are to grow quickly and spread. The research, which involved Washington University physicians and scientists at the Siteman Cancer Center and The Genome Institute, is published June 10 in the advance online edition of Nature. The study involved DNA from 77 post-menopausal women with stage 2 or 3 estrogen-receptor-positive breast cancer, the most common form of the disease. Estrogen stimulates the growth of these tumors, and all the women received aromatase inhibitors to lower estrogen in the body. The drugs can reduce the size of breast tumors, enabling many women to receive breast-conserving surgery rather than a mastectomy. But aromatase inhibitors only work in some women, and doctors don’t know why. To answer that question, the researchers compared the DNA in the tumor samples to matched DNA from the same patients’ healthy cells, which allowed them to identify mutations that only occurred in the cancer cells. This “unbiased” approach finds all the mutations underlying a patient’s cancer not just those that would be expected to occur. The tumor samples came from women enrolled in one of two aromatase inhibitor clinical trials sponsored by the American College of Surgeons Oncology Group. As part of those trials, researchers had collected detailed information about the women’s tumors and whether they responded to a four-month course of aromatase inhibitor therapy before surgery. Twenty-nine of the tumor samples came from women whose tumors were resistant to aromatase inhibitors, and 48 came from patients whose tumors responded. Over all, the scientists noted that tumors in women who responded to the estrogen-lowering drugs had relatively few mutations, while those whose cancers were resistant to the treatment had higher mutation rates and were genomically more complex. “This makes sense in hindsight but it’s not something that we would have predicted,” Mardis says. The researchers identified 18 significantly mutated genes in the tumor samples, meaning the genes were altered more often than would have been expected. Some of these genes were already known to be important in breast cancer but others were completely unexpected, including a handful that are well-recognized for their role in leukemia. To evaluate the clinical significance of the 18 genes, the researchers expanded the study to include an additional 240 women with estrogen-receptor-positive breast cancer whose response to aromatase inhibitor therapy also had been documented. They found several genes that were relatively common in many of the patients’ cancers that also appeared to be linked to treatment response. About 20 percent of women’s tumors had mutations in a potent tumor-suppressor gene called TP53. These mutations were linked to a poor response to aromatase inhibitors and to fast-growing tumors that were more likely to metastasize. Women with TP53 mutations also were more likely to have a subtype of breast cancer called luminal B, which has a poor prognosis. “Rather than give aromatase inhibitors to women with TP53 mutations knowing they are unlikely to be effective, these women may benefit from immediate surgery followed by chemotherapy,” says lead author Matthew Ellis, MD, PhD, the Anheuser-Busch Professor of Medical Oncology, who treats patients at the Siteman Cancer Center and Barnes-Jewish Hospital. In contrast, mutations in MAP3K1 and its “sister” gene MAP2K4 occurred in about 16 percent of patients and were linked to a good response to aromatase inhibitors. Women with mutations in these genes were more likely to have slow-growing tumors that did not spread, and they typically had luminal A breast cancer, which has a good prognosis. Mutations in another gene, GATA3, also appeared to predict a good response to aromatase inhibitor therapy, while those in MALAT1, a long stretch of non-coding RNA, seemed to be associated with poor outcomes. Mutations in most other significant genes occurred in frequencies too low to draw firm conclusions, but Ellis says it’s premature to dismiss their importance. At the recent American Society of Clinical Oncology meeting in Chicago, Ellis detailed a list of low-frequency mutations in estrogen-receptor-positive breast cancer that already can be targeted by existing drugs, many of which are approved for tumors other than those in the breast. He says that studies like this one may provide a backdrop for finding new cancer treatments based on a tumor’s genomic signature rather than its location in the body. Toward that goal, Ellis and Mardis will soon begin a new trial in patients with estrogen-receptor positive breast cancer, with treatment decisions based on the genomic signatures of tumors. Women likely to benefit from aromatase inhibitor therapy will receive it, but those unlikely to respond will be assigned to surgery followed by chemotherapy and drugs that target “driver” mutations in their tumors. Ellis, MJ, Ding L, Shen D, Ley TJ, Piwnica-Worms D, Stuart JM, Wilson RK, Mardis ER. Whole-genome analysis informs breast caner response to aromatase inhibition. Nature. Advance online publication June 10, 2012. The research is funded by the National Human Genome Research Institute, the National Cancer Institute, both at the National Institutes of Health (NIH), the Susan G. Komen for the Cure, the Fashion Footwear Charitable Foundation, Inc., and the Washington University Cancer Genome Initiative. Grant awards to the American College of Surgeons Oncology Group included NCI, the Breast Cancer Research Foundation, clinical trial support from Novartis and Pfizer and an NCI Center grant. The BRIGHT Institute is supported in part by an ATT/Emerson gift to the Siteman Cancer Center. The research is dedicated to the memory of Evelyn Lauder in recognition of her efforts to eradicate breast cancer. The Siteman Cancer Center is the only NCI-designated Comprehensive Cancer Center within a 240-mile radius of St. Louis. Siteman Cancer Center is composed of the combined cancer research and treatment programs of Barnes-Jewish Hospital and Washington University School of Medicine.